“The vineyard is our bank savings so we must protect it,” says Giusto Occhipinti at COS winery in Sicily. The vineyard is our bank savings. COS is located in the southeast of Sicily, 10 kilometers from Vittoria, home to Cerasuolo di Vittoria , so far the only DOCG on the island. Local varieties are grown, mostly the black nero d’avola and frappato and the white grecanico and insolia. Giusto has given a lot of thought to the advantages and disadvantages of different kinds of fermentation and storage containers. Hi did experiments and finally decided on the clay amphora of 440 litres. 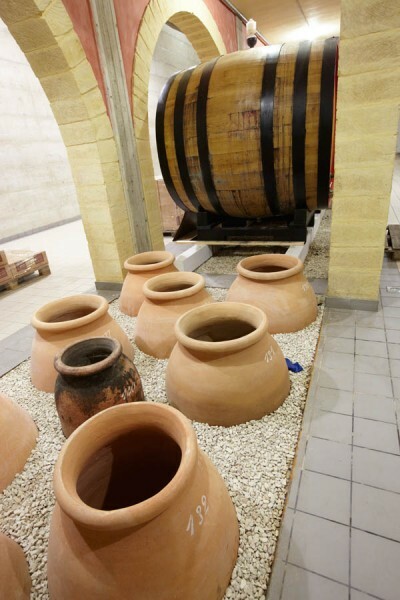 “Clay is like oak”, he says, “the wine breathes but the advantage with clay is that it gives no taste to the wine.” He uses the amphora for both fermentation and storage. Sometimes the skin contact is long, up to six months. “That way I do not need to add any sulphur,” he says “long skin contact acts as an antioxidant.” He also uses concrete tanks and botte, the large oak casks. The steel tanks in the winery are used only for blending. Made of white grapes grecanico (a relative of garganega in Soave). Six months of skin contact gives intense aromas of peach and apricot. Quite fat in the mouth but with a good freshness. Interesting wine made entirely in amphora. 25 year old vines of insolia and grecanico that ferment with the skins during ten days in concrete tanks. Dark color, aromatic and smoky, even some tannin from the skins. Concentrated and intense flavors of apricots and other ripe fruit. The red COS Frappato is made partly in amphora and partly in concrete tanks. It is an unpretentious and easy to drink wine but very fresh and pleasant with a very attractive fruit. Frappato makes up 60% of the Cerasuolo di Vittoria, Sicily’s only DOCG. The remaining 40% is nero d’avola. Here we have more elegance and a more rripe fruit, but also here the structure is quite light and the acidity fresh and lively. The grapes are 45 % cabernet sauvignon, 45 % merlot and 10 % nero d’avola. The nero d’avola-grapes are harvested early to give acidity of the wine. “It’s better than acidifying”, says Giudo. This is a complex wine with ripe fruit and a slightly smoky tone on the nose. Very intense and a good length. 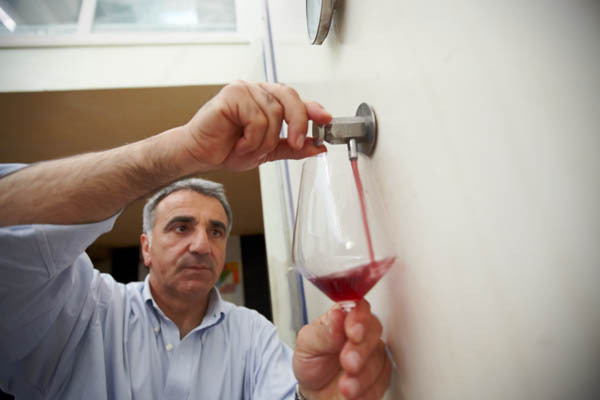 If you are interested in wines from Sicily, or from other parts of Italy, then you can come on a wine tour to Sicily or to Italy organised by BKWine. I’ve been a fan of both Giusto and Arianna for a long time. There are many posts on them on my blog (http://arnoldwaldstein.com ). I especially like the presentation around use of amphora. I spoke with Giusto with Arianna translating about the use of amphora at RAW in London a month ago. I thank you for this post and the great pics. I plan on sending it around to friends with whom we’ve been discussing the use of amphora. I’ll share this snapshot of Giusto and Arianna with you. Really great people. Again..nicely done. You brought Cos to life. I’d love to take a small group tour with a handful of bloggers to visit the natural winemakers in that area. We should discuss this sometime. More on amphora coming soon. Keep your eyes open! I recently tasted a wine of two from this producer in Paris at a tasting organised by their importer. The ones I tried were horrendously expensive and were also totally deviant, with some very unpleasant flavours. Only for the brave unconditionals of the mumbo-jumbo I fear! Others beware, even if it all looks nice and clean in the photos! You know – Photoshop magic! I’ll let Britt comment on the tasting notes (if she wants). Perhaps a question of having tasted them on Sicily or in Paris? Or a question of liking “natural” :-O or not?